SK Telecom (NYSE: SKM) today held a press conference at its Seoul headquarters to introduce NUGU*, an artificial intelligence (A.I.) service based on voice recognition technology. The company has also shared plans to further develop its A.I. platform and services in cooperation with third party developers and customers. *The service name “NUGU” is a Korean word for “who” and has been chosen to create an image that it can become anyone – i.e., user’s friend, family, assistant, and so on. To be launched on September 1, 2016, NUGU marks the first virtual home assistant service that understands and processes the Korean language. 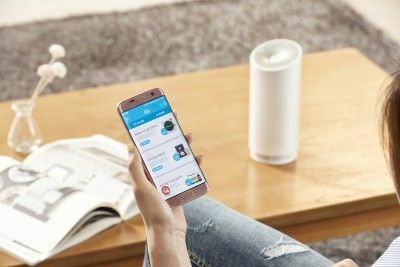 With the aim to create an intelligent voice assistant that can interact in Korean, SK Telecom began developing advanced technologies in areas including artificial intelligence, speech recognition and natural language processing since 2012. In particular, NUGU boasts the highest voice recognition rate in Korea, understanding various voice tones, accent and dialects, and through the application of SK Telecom’s self-developed natural language processing engine, it is capable of interpreting what the user has actually said and interacts with the user by voice. 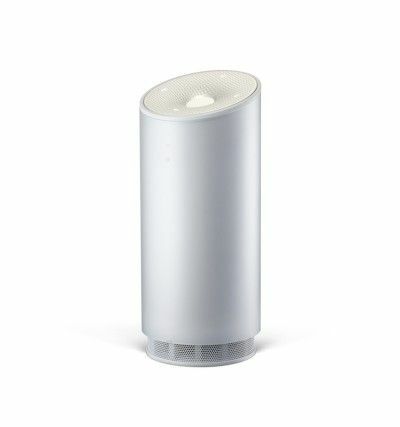 NUGU will be first realized through a stylish, white, 21.9cm–tall cylinder-shaped device also built to work as a home speaker and LED lighting. In particular, with the participation of Astell & Kern in optimizing the speaker sound quality, the NUGU-dedicated device delivers a strong performance as a home speaker with 15 Watt, 2.5-inch woofer, 2-inch tweeter. NUGU is connected to the cloud via Wi-Fi. After recognizing the user’s voice and understanding his/her intentions through natural conversations, NUGU provides a wide variety of services including ▲music service (e.g. music recommendation and playback), ▲smart home service (e.g. control of smart home devices including smart electric plug, gas valve lock, air purifier, and dehumidifier) and ▲ assistant service (e.g. weather information, schedule notification, smartphone location tracking, etc.). Users can initiate a dialogue with NUGU by using one of the four wake words (Aria, Crystal, Rebecca, and Tinkerbell) and then make voice requests to NUGU. For instance, when the user says “Aria, play me some happy music,” NUGU will instantly play a list of upbeat songs, and answer to user’s questions regarding these songs (title, singer, etc.). Also, when the user asks, “Aria, I am going to the baseball park tomorrow. How will the weather be tomorrow in Incheon?,” NUGU will deliver weather forecasts for that specific area in a spoken response. Through the application of a cloud-based deep-learning _framework, NUGU is designed to evolve by itself. 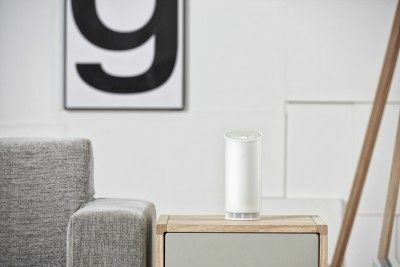 NUGU will be able to strengthen its own performance - including speech recognition accuracy - with the growing number of customers who use the service. Moreover, SK Telecom plans to constantly enhance NUGU’s functionality through over-the-air (OTA) software updates. In particular, to meet customers’ varying needs, the company will add new and diverse functionalities, including ▲voice-enabled commerce services like internet shopping and food delivery, ▲real-time traffic/transportation information service linked to T Map (Korea’s top mobile navigation service provided by SK Telecom), and ▲media services such as internet radio, news and audiobook player. Besides the speaker-type NUGU-dedicated device, SK Telecom also plans to combine its NUGU service with diverse types of devices, such as in-vehicle IoT device, wearable IoT device and humanoid robot, so as to evolve NUGU into an artificial platform that delivers unprecedented value and convenience to every part of people’s lives. Furthermore, in the first half of 2017, SK Telecom will open NUGU’s Application Programming Interfaces (APIs) to boost the creation of an ecosystem surrounding NUGU by working closely with diverse startups, SMEs and experts in the field of artificial intelligence to develop NUGU-related services. The NUGU-dedicated device can be purchased at the NUGU homepage (www.nugu.co.kr) and online shopping site ‘11st (www.11st.co.kr)’ from September 1, 2016. Customers who participate in SK Telecom’s special launch event designed to boost the use of NUGU will be able to purchase the NUGU device at a special discount price of KRW 99,000 until October 30, 2016, and at KRW 149,000 from November 1 to December 31, 2016. The NUGU-dedicated device is priced at KRW 249,000.